The TH&B was a subsidairy of the Canadian Pacific and New York Central. Based in Hamilton, Ontario, the TH&B never reached Buffalo or Toronto, and was wholly absorbed into the CP in 1977. Between May and August 1949, the National Steel Co of Canada built 300 steel boxcars to replace the aging USRA boxcars bought from the NYC earlier in 1940. These were assigned road numbers as Series 3000-3299 and originally painted tuscan red with all white stenciling. In 1953, the TH&B received a second order of 300 cars of the same design as Series 3300-3599. 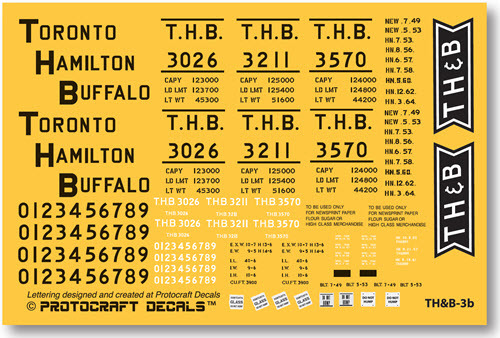 Series 3000-3299, were repainted in the new yellow and black scheme (Protocraft Decals TH&B-3a) starting in 1952; and in 1955, this second yellow and black lettering scheme was introduced and applied to both series as the cars came in for repainting and heavy servicing.